01 Nov 2018 --- PepsiCo has acquired Health Warrior, a US-based nutrition company that makes plant-based products including bars. The transaction will further expand the company's nutrition portfolio and marks the first investment led by the PepsiCo HIVE, a new entity within PepsiCo designed to grow emerging brands. Health Warrior makes products that contain plant-based ingredients and are made from non-GMO and gluten-free ingredients. Its current offerings include nutrition bars made with chia and pumpkin seeds, as well as plant-based mug muffins and protein powder. Health Warrior was founded in 2011 by a group of college friends, Dan Gluck, Nick Morris and current Chief Executive Officer Shane Emmett, who wanted to make nutrient-dense foods more accessible. Emmett will continue to lead the business from its current headquarters in Richmond, Va. The acquisition marks PepsiCo's first investment that will dock into The PepsiCo HIVE, a newly-created entity within the company focused on growing emerging, smaller brands. The HIVE is to help PepsiCo deliver on its Performance with Purpose goals of continuing to transform its portfolio to meet changing consumer needs and achieve sustainable, long-term growth, according to the company. It will nurture and grow smaller, existing brands within its portfolio including Maker Oats, Stubborn Soda and Looza fruit nectar beverage; new brands in developing, high-opportunity spaces; and inorganic concepts still building momentum and critical mass. 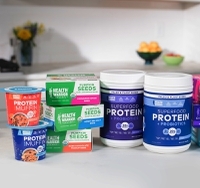 The acquisition of Health Warrior comes at a time when consumer gravitation towards plant-based diets continues to spur NPD in multiple product categories. Growing consumer interest in health, sustainability and ethics are driving plant-derived ingredients and products into high popularity. Innova Market Insights has reported that plant-based product claims increased by 62 percent globally (CAGR, 2013-2017) with growth occurring on platforms such as plant proteins, active botanicals, sweeteners, herbs and seasonings and coloring foodstuffs.